That's not a full check – I can say nothing about transistors' quality params. But I can say one thing for sure – even if one of these tests is failed the transistor is definitely dead. 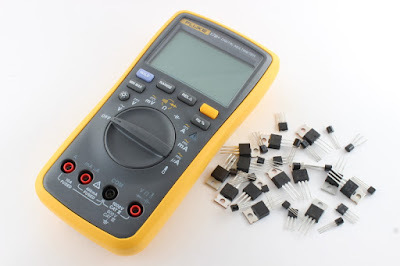 Switch the multimeter to the diode test mode. Connect the multimeter's positive lead to the base and negative lead to the collector. Multimeter should read some voltage across the p-n junction (something like 500–700 mV). Switch the negative lead to the emitter. Multimeter should read some voltage too. Now connect the negative lead to the base. Connect positive lead to the collector, and after that to the emitter. In both cases the multimeter should display an open circuit (FLUKE, for example, shows ".0L"). Connect one lead to the collector and the other to the emitter. Then swap the leads. Again we should read open circuit in both cases. Connect the multimeter's negative lead to the base and positive lead to the collector. Switch the positive lead to the emitter. Now connect the positive lead to the base. Connect negative lead to the collector, and after that to the emitter. In both cases the multimeter should display an open circuit. Connect the multimeter's negative lead to the source and positive lead to the drain. This time the gate is disconnected. The multimeter should display an open circuit – the transistor is turned off. Disconnect the positive lead from the drain and momentarily connect it to the gate. Reconnect the lead to the drain. Multimeter should read some voltage. The transistor is turned on and it will stay open as the gate acts like a small capacity. Discharge the capacity connecting the source and the gate with a finger. The multimeter should display an open circuit again – the transistor is turned off. Connect the multimeter's negative lead to the drain and positive lead to the source. This time the gate is disconnected. Disconnect the negative lead from the drain and momentarily connect it to the gate. Reconnect the lead to the drain. Discharge the capacity connecting the drain and the gate with a finger.